I’m going to make a bold guarantee to you. If you read and apply the technique in this article, you’ll be able to take ANY song you’ve written and make it BETTER. Now matter how good it is, it will be even greater after using the one simple idea I'm about to share with you. A great song is sort of like a “greased slippery slide”. This means that when someone jumps on the slide (ie: begins listening to your song), it’s IMPOSSIBLE to get off! Each new movement in your song “pulls them along”. It’s like being taken on an extraordinary journey, and they dare not stop listening for a second. What I’d like to do is give you free song writing tips that will “add grease” to your slippery slide. Once you’ve applied this it will make it ultra hard for your listeners to not thoroughly enjoy every single moment. 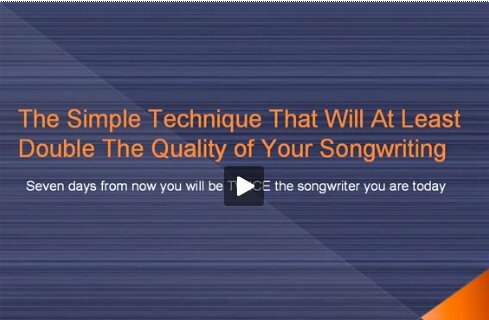 The strange thing is, these free song writing tips are so simple, yet incredibly underused. This is actually good news for you because using it will cause your songs to stand out easily and capture attention effortlessly. Read on below to discover this little free song writing tip that will inject magic into your tracks. What happens when you are eating something you don’t like and then you switch to something you love? You enjoy the difference in taste, probably more than usual because of the contrast between the disgusting food and the irresistible food. In your songwriting arsenal of tools, contrast is up there with the best of them. Well, the Oxford dictionary describes contrast as: the state of being noticeably different from something else when put or considered together. When you write music, you can use contrast to create interest. The listener is in your control. It’s your job to maintain interest in your music, sucking and pulling your listener through the song. Think of your music like a slippery slide. You must create it so once your listener has begun sliding down the slide, it’s impossible for them to get off until they reach the end. How can you do this with your music? The answer is: by making every part of your work alive with wonder, interest, and intrigue. Every time you introduce a new idea, new sound, etc, you are causing a moment of contrast. You are creating a change, which peaks the interest of your listener. Even small contrasting moments can be highly effective for maintaining interest. For example, if you had two identical verses in a song, you could make a slight change to the rhythm in the second verse. While your listener may not know exactly what is different, they do feel the difference and it serves to keep them floating along with the song. You can also create large contrasting moments. These at times can be powerful! For example, you might have a quieter passage followed by a thundering climax full of excitement. These types of moments serve you well in stirring up emotion in your listeners. Large moments of contrast can be very memorable. Here are the different ways you can create moments of contrast in your music, which will cause every moment to be interesting and irresistible. • Volume- Changing the volume of separate instruments or the entire song creates movement in the track. It is one of the easiest and most powerful ways to create wonderful contrasting moments. • Taking out instruments-doing this can create a “calming moment” where the intensity of the song dies down in an instant. This can be very effective after a loud, epic passage. • Changing the sound of your instrument-An obvious example of this is going from a clean guitar sound to a distorted sound. Even playing the same idea will change the mood from relaxed to aggressive. You can create more subtle versions of this as well, which won’t be obvious to the listener, but they will feel the difference. • Change of musical idea-For example, playing from a verse into a chorus. The trick though, is to use this in combination with one or two of the above methods. Create a big contrasting moment. Make it interesting. Change the volume for impact. What other ideas can you think of? When you have arranged a basic “sketch” of a song, sit down and listen through it, paying attention to where and how you can create moments of contrast. Note down anything and everything that comes to mind. Is there a moment when a background vocal line or lyric comes to mind? Is there a moment when you could introduce a sound in the background of the track? Is there a moment when a volume change could create an impact? Can you introduce a new melodic component over the current melody? Every contrast you can create will make your music more interesting. Always be on the lookout for how you can create contrasting moments in your music. Be sure to follow the free song writing tips outlined in this article, and I GUARANTEE your songs will be MUCH better for it. And if you'd like to discover many more songwriting tips and techniques that will take you're songwriting to breathtaking new levels, check out The Songwriting Genius Within You. So that's the key! I never would have guessed until I read your article. Thank you Geoff!! Thanks for the tip. I am enjoying your course I got last month. Thanks. Good advice - i really appreciated this article. Sending my best wishes to you, friend. Thanks for the tips. Just when I needed an extra push to get me to the next level. Can't stop now. I've traveled so far. Thankyou soooooo much Geoff. This is exactly the tip I needed!